John Minerd was born on Nov. 27, 1804, near Kingwood, Somerset County, PA, the eldest son of Jacob and Catherine (Younkin) Minerd Jr. As a fourth generation Pennsylvania farmer, he was fluently bilingual in German and English, and passed down the German language to his children. He also sold small parts of his farm for the community's use as a school and a church. The Minerds had seven children -- Henry A. Miner, Catherine Rose, Sarah Minerd, Susanna Rose, Martin Miner, Joanna Enos and Hannah Murray. Sadly, daughter Sarah, born in 1832, apparently died in childhood, as nothing more is known about her. The family lived on a large section of a 500-acre farm at Hexebarger, near Kingwood, which John and his father jointly bought in 1837. Seen here, an old survey of John's 124-acre tract, found in the Somerset County Courthouse. To the south and west of his farm were lands owned by the heirs of John Younkin, presumably his grandfather of that name who had died in 1826. John appears to have been hot-tempered but also compassionate. In 1828, he was sued for slander when he refused to take back his accusation that one of his Younkin cousins had stolen a sheep. (Click here to read an account of the lawsuit.) The case shows that John spoke his angry words in German and in English, and that everyone who was nearby and heard the words fully understood their meaning. Later, when his daughter Catherine wished to marry Charles Rose in 1846, John opposed the idea. Disregarding John's point of view, an eyewitness later wrote, they "eloped, and agreed to be man and wife. But her Father afterward forgave them, and called them home and insisted on them being legally married, which they did." Despite the fact that John and his father purchased a farm together, they did not share common politics. Father Jacob was a Whig, a political party of the time which favored the interests and rights of property owners. John, on the other hand, named one of his newborn sons "Martin" apparently in honor of newly elected President Martin Van Buren, who was a Democratic reformer opposed to the Whigs, and who fought for policies that made more money more easily available to the common farmer of the day. In 1846, the Minerds sold a small portion of the southern edge of their large farm (121 square perches) to the School Directors of Upper Turkeyfoot Township. The directors "erected a small house" on the property. However, after a span of 21 years had passed, the school must have fallen into disuse or the pupils were consolidated into another building. in 1867, the trustees (among them Alexander Rhoads, Hiram Cramer, Noah S. Snyder, John F. Kreager and Jacob C. Younkin) sold the building and land back to the Minerds' son in law, Charles Rose. Rose then sold the parcel to Rhoads. I hereby caution the public not to trust any person or persons whomsoever, on my account, without express orders from myself, as I shall not pay any debts whatever contracted by any one, except such as I may authorize by a written order -- of which all persons will please take notice. In 1854, John and Sarah sold another small parcel (25/160ths of an acre) to the trustees of the Methodist Episcopal Church. The tract was near the Minerds' home, along a public road cutting through their farm on a northwest-southeast orientation. The trustees at that time were John's brother Jacob as well as Rev. Harmon Younkin, Samuel McMillen, Jonas H. Younkin and Daniel N. Beal. The church was named "Mt. Zion" though it's unknown whether a building actually was constructed. Harmon Younkin likely was the preacher of this church. The move to create a church of the Methodist denomination here may have been driven by competition from the new Old Bethel Church of God, which had been constructed about a quarter of a mile away and whose congregants included members of John's Minerd and Younkin families. Ironically, a year after its founding, trustee Jonas H. Younkin died an untimely death at the age of 30. In another twist, trustee Harmon Younkin, who also was a local postmaster and Upper Turkeyfoot school treasurer, became the father in law of John's nephew Ephraim Miner. Nineteen years after its founding, in 1873, the church tract was sold back into private hands by the remaining trustees -- Harmon Younkin, William Eicher and John Eicher. It's possible that the church was rolled on logs to a new location. It's thought that the Mt. Zion congregation then joined with a newly formed church, the Mt. Bethel Church at nearby Paddytown. The following year, in 1874, a "new meeting-house was erected by the Methodists... -- a frame building which cost fourteen hundred dollars," said the 1884 book, History of Bedford, Somerset and Fulton Counties. "The first minister was Rev. M.C. Lichliter; trustees Herman Younkin, Samuel Phillippi, Wm. Eicher, Dr. Wesley Cunningham, John Blubaugh and John S. Cramer; classleader, Samuel Phillippi." The Civil War was very difficult on John and Sarah, from an emotional point of view as well as economic. Two of their sons, Henry and Martin, and three sons in law, Charles Rose, Andrew Jackson Rose and Perry Enos, served in Pennsylvania regiments during the war. (A.J. Rose unfortunately was shot in the forearm at the Battle of Gettysburg, and had the arm amputated.) Two of their nephews, Michael A. Firestone, and Ephraim Miner, were wounded or injured at the Battle of Fredericksburg. Because of the noticeable absence of able-bodied farm laborers, it would have been hard for 60-year-old John to cultivate and manage his farm alone, and it may have led to his decision to sell if in fact he was unable to fully produce his crops. Orange dot in the upper right section shows John's farm (marked "J. Minor") in the 1872 Atlas of Fayette County, near Elm (today's Normalville), while the green dot marks the farm of his brother Jacob. After the Civil War, when son Henry was back home from the Army, he too faced a slander lawsuit when -- in German words -- he accused a local woman of adultery. The case demonstrates that the German culture and language was so strong that it had endured for 130-plus years since the family's German immigrant, Friedrich Meinert, had come to America. Sarah died shortly after the move to Normalville, sometime in 1865 or 1866. She is buried at the Normalville Cemetery, in the back of the old church. Her grave is not marked, but seen here is a hand-drawn map by granddaughter Agnes Miller. It shows the precise location of Sarah's otherwise lost resting place. She lies between her son in law Elijah Murray and her young granddaughter Sara E. Miner. After a year or two as a widower, John married his wife's sister Hannah Ansell (1814-1885) in November 1867. She had an adult son, Michael A. Firestone, from an earlier relationship. John suffered from asthma, and died of its effects on Nov. 12, 1879, at the age of 73. He is buried in an unmarked grave either at the Normalville Cemetery, or in a private plot on the farm once owned by his son Martin. George Kern was named executor of John's estate. Among other debts, he paid $8.75 to great-nieces Rachel and Susan Long for labors they had performed. 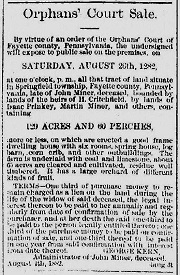 An orphans' court sale was scheduled to be held at John's farm on Aug. 26, 1882 to dispose of assets from the estate. An advertisement was placed in the Connellsville Keystone Courier. The sale was postponed, to Dec. 2, 1882, and so the advertisement was printed again in the Nov. 17, 1882 edition of the newspaper. The ad stated that the property consisted of "129 acres and 60 perches, more or less, on which are erected a good frame dwelling house with six rooms, spring house, log barn, corn crib, and other outbuildings. The farm is underlaid with coal and limestone, about 65 acres are cleared and cultivated, residue well timbered. It has a large orchard of different kinds of fruit." The ad noted that one-third of the purchase money was to remain as a lien on the land during Hannah's lifetime as the widow. On Aug. 7, 1885, widow Hannah passed away, at the age of 71, possibly occurring in Normalville or in Connellsville. Her final resting place is unknown, but may be in the old section of the Methodist Church in Normalville, where others in the family are buried. Under the terms of her will, on file today in the Fayette County Courthouse, she wrote that her son Michael was to receive "absolutely and forever all my estate, real, personal and mixed of any and of every kind whatsoever..." This included four head of cattle; all household and kitchen furniture, including one cupboard and dishes; three bedsteads and bedding; one wood cooking stove; one sink; and one bureau. He also was to receive payment of debts owed to the estate by Henry Ansell ($300, as decreed by the Court of Common Pleas of Somerset County); by the estate of her late husband ($50); and by her brother in law Jacob Minerd III ($40). at the 2011 reunion, in a tour at his old farm. 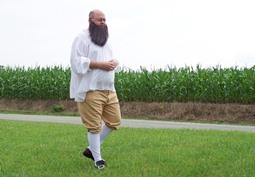 In July 2011, the Minerds' great-great-great grand-nephew, founder of this website, portrayed John in a one-man monologue, in costume, as part of a driving tour during the national Younkin-Junghen family reunion. The tour stop was at John's old farm near the Old Bethel Church in Kingwood, Somerset County, PA. The monologue covered the effect the Civil War has had on John, including the pending financial failure of their farm due to lack of available able-bodied men to help with the crops, and on his wife Sarah, who "suffers terribly" from worry, anxiety and nervous prostration. The remarks also focused on Minerd's like and dislike of his "crazy" Younkin kinsmen but most especially his five sons and sons in law who are away in the Civil War, with one terribly wounded at Gettysburg, and another a deserter. In closing, he commented on how his angry words spoken in the year 1828 in German and English, against a Younkin cousin, led to a fascinating lawsuit in the Somerset County Court of Common Pleas, and how his hot-headed son Henry's words, also spoken in German decades later, got him into trouble as well. 1860 Map of Somerset County courtesy of the Pennsylvania State Archives. Somerset Herald advertisement courtesy of Chronicling America, sponsored jointly by the National Endowment for the Humanities and the Library of Congress, with cooperation from Penn State University Libraries. Keystone Courier ad courtesy of Ancestry.com.